Make a colourful mess out of your friends by firing exploding balls of paint at them. Paintball is the classic action packed day out. Paintball for kids! 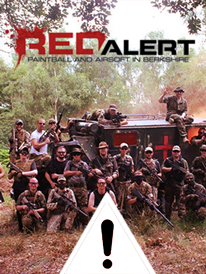 Low impact and less daunting than regular paintball but with all the thrills and excitement. For ages 7 and up. Thrilling, tactical action with gear that looks like the real thing. Our site and equipment suits everyone from total beginners to serious enthusiasts. Red Alert's battlefield is 35 acres of specially marked out woodland. Between the winding paths and dugout trenches you'll find bunkers, military vehicles and all features to take cover or set up ambushes behind. If you have any questions about our site or the experiences we offer, please don’t hesitate to ask! Our friendly, experienced team can tailor events to your group and help prepare your and your friends for a day of action on our site.